I have recently been following the Keto diet to some degree, as I have gained a couple of extra pounds. For those of you who are unfamiliar with it, in very simple terms the Keto diet is a low carb, medium protein and high good fats diet which if followed correctly, helps one reach a state of ketosis where the body starts burning fat and not carbohydrates and the pounds literally melt away. There are numerous health benefits in following such a diet including helping reduce high cholesterol, preventing Alzheimer's and preventing epileptic seizures. Since going on the Keto diet, I have become obsessed with reading nutritional information and in particular finding out how many net carbs are in a serving of a particular food product. To calculate net carbs, subtract the number of grams of dietary fiber from the number of grams of total carbohydrates. 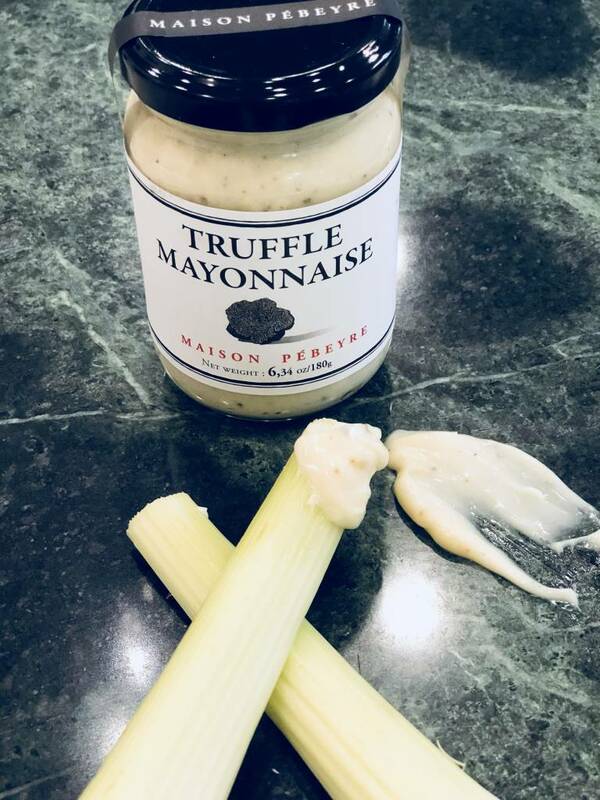 To my utter delight, I discovered that one of my favorite gourmet products, Maison Pebeyre's Truffle Mayo has zero grams of carbohydrates. This creamy french mayo with bits of truffle is very versatile and can be used in many ways to produce easy and tasty dishes. One of my favorite ways of using truffle mayo is as a dip for celery (a stalk has 0.5grams of net carbs) and I have a yummy snack that doesn't add on any extra pounds. If you are looking for a low carb side dish that is amazing with fish and salmon in particular, drizzle some truffle mayo over fresh roasted asparagus - yum!! You can also add truffle mayo to hard boiled eggs to make a low carb truffle egg mayo which you can eat with some leafy greens for a satisfying lunch. Red meat eaters can simply add some truffle mayo to their grass-fed (healthiest animal fats) hamburger without the bun and you have a delicious main course. For those not on any diet, you can most certainly use truffle mayo as a dip for your french fries or to make a potato salad. Add some to a roast beef sandwich, or to cold pasta and veggies to make an awesome pasta salad. So, you don't have to necessarily have real truffle oil at home to enjoy that earthy truffle taste. Just buy a jar or two of Maison Pebeyre's Truffle Mayo and you won't be disappointed.